So how were the movies for you this year? It was the year of the Issue Picture, from the delightful ‘Black Panther’, although based on a sixties comic, to ‘If Beale Street Could Talk’, a moving family drama – the link here being people of colour getting out of the sidelights and into front-centre. There were, if anything, too many issue pictures, especially for liberals who need little convincing about the issues at large. So we had ‘Men and Monsters’, ‘Beast’, ‘Beautiful Boy’, ‘BlackKKlansman’, ‘The Hate U Give’ and many more preaching to the converted because they would only have limited releases. We knew where too many films were going before they got there. A case in point is the well-intentioned ‘A Private War’, about war correspondent Marie Colvin, who was driven by the need to bear witness and show the world suffering from a human perspective, only to lose first her eye, then her life in the field. Since anyone attending this would doubtless know the outcome, the film consists of repeated forays into war zones and seeing the deadly result of conflict – yet somehow it felt too Hollywood, and even the ruins of society are picturesquely sunset-tinged. 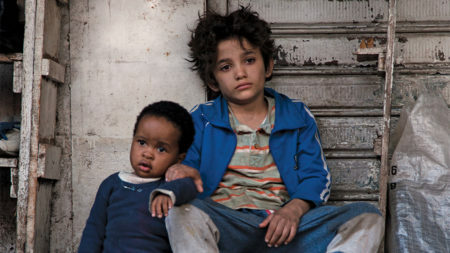 Contrast this with a Cannes winner like ‘Capernaum’, which shows the devastating effects of poverty on a young boy. The film would be unbearable if not for its amazing casting, which also features the youngest ‘actor’ I’ve seen on-screen. A lengthy centre-section consists of a single day’s trudge through the slums of Beirut, and gives us the most memorable image of the year. Even if the wrap-around story is slightly unbelievable it offers up a bravura speech from the mother, whom we suddenly see in a different light. Hollywood simply cannot make films that look and sound like this. They can’t make a crime thriller like ‘Dogman’ either, which concerns an impoverished Italian town run by petty gangsters, and a poodle groomer who almost unconsciously decides to make a stand against them, only to suffer the most devastating of consequences. It features a long-gestating murder, the like of which I have never seen in a Hollywood movie. Can world cinema be fun, though? The last time I saw something really bouncy come out of Russia was ‘Hipsters’, the Soviet Union’s first musical in about fifty years, which played out like a mad mash-up of ‘Grease’ and ‘Cry Baby’. ‘The Square’, about the pretentiousness of the modern art world, was fun if uncomfortable to watch. Perhaps that’s the difference between world cinema and Hollywood cinema – world directors constantly step outside of their [and our] comfort zone while Hollywood feels it must make everything palatable. For me the highlights were smaller and pricklier tales like ‘Can You Ever Forgive Me?’, ‘Annihilation’, ‘Green Book’ and ‘McQueen’. Netflix may achieve the impossible and get ‘Roma’ to Best Picture. It’s great filmmaking and safely middle class, and a hell of a lot more fun than ‘Aquaman’. In the absence of big, intelligent US blockbusters it’s not a bad choice.